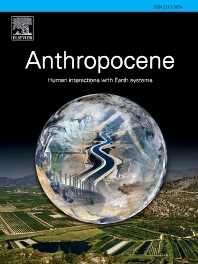 Anthropocene is an interdisciplinary peer-reviewed journal that addresses the nature, scale and extent of interactions between people and Earth processes and systems. The scope of the journal includes the significance of human activities in altering Earth’s landscapes, oceans, the atmosphere, cryosphere, and ecosystems over a range of time and space scales - from global phenomena over geologic eras to single isolated events - including the linkages, couplings, and feedbacks among physical, chemical, and biological components of Earth systems. The journal also addresses how such alterations can have profound effects on, and implications for, human society. As the scale and pace of human interactions with Earth systems have intensified in recent decades, understanding human-induced alterations in the past and present is critical to our ability to anticipate, mitigate, and adapt to changes in the future. The journal aims to provide a venue to focus research findings, discussions, and debates toward advancing predictive understanding of human interactions with Earth systems - one of the grand challenges of our time. The early 'Anthropocene': How and when were past human interactions with Earth systems registered in the geologic and environmental records? Evidence and causes of large-scale human impacts; and quantifying recent, current and future anthropogenic impacts. Couplings among bio-physical and human processes, including societal responses to human-induced environmental change. Managing risk toward human-environmental sustainability in an 'Anthropocene' 21st century. Original research articles that present new data and analyses toward answering specific questions, with typical length of text in the 5000-7000 word range. Research articles may include specific case studies if these studies demonstrate theoretical significance and broad systemic relevance. Review papers that assess the state of knowledge of a particular subfield or topic and point toward future research needs and directions. These review articles, with a typical length within 8000 words, may include some new data or synthesis of existing data that produce new understanding. Viewpoints that address timely topics, and discussions and replies of articles published in the journal. The length of these articles should be within 2000-3000 words.